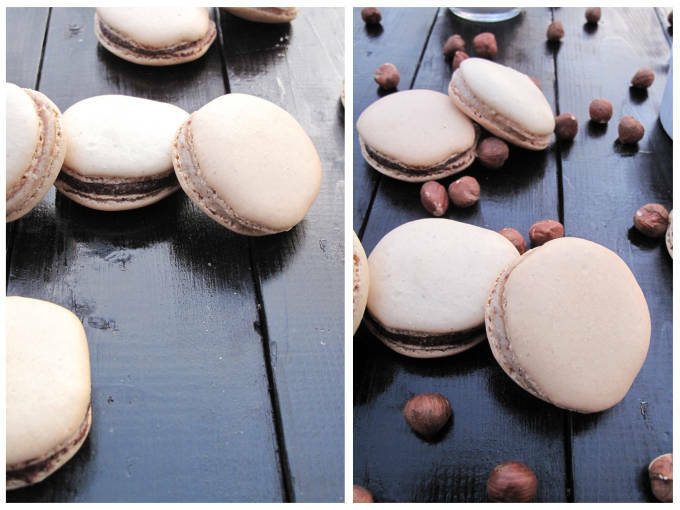 Are you looking for a step by step tutorial for making French macarons? You should check my tutorial out then! About a year ago I decided I wanted to get a part-time job at a bakery and began to search Craigslist for an opportunity. I came across a top Toronto French bakery and chocolatier that made bright and colourful French macarons and chocolate truffles with exciting and intricate designs. The brilliant designs were simply shells though for lush creams, ganaches, and liqueurs. Naturally, I sent in my résumé. And then I got a call. They wanted to interview me. I was fifteen and a famous Toronto bakery wanted to interview me. They wanted me to bake for them. During the interview the head pastry chef seemed really impressed. 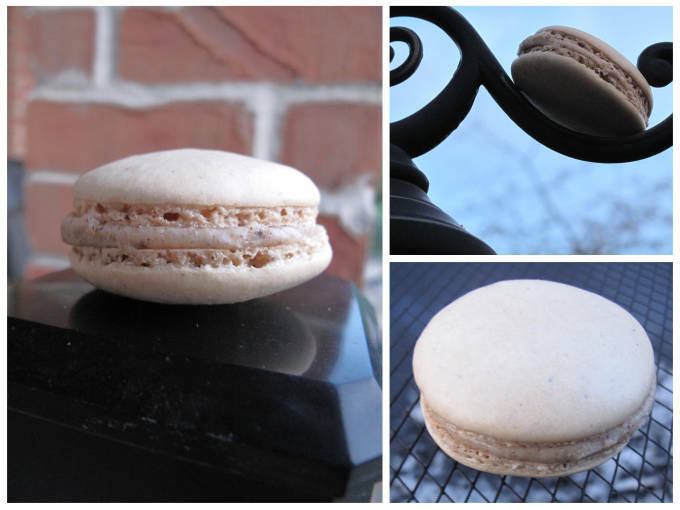 I went through my old French macaron recipe method step-by-step, even mentioning how to grind the almonds so that they wouldn’t turn into a nut butter. He called over the sous-pastry chef and asked me to repeat my method to him. I did. He was also impressed. Then they told me that they wouldn’t need me to make macarons for them since they made those at night. They said that the position would mean a separate station in the kitchen where I could create my own plated desserts. I then got a tour of the entire bakery, including the kitchen. After an hour long interview, and meeting the general manager, I went home with some complementary truffles in hand. Two days later I got a call. They wanted to hire me. The head pastry chef said that he’ll give me a call back soon and we would discuss wage and hours. I waited for a few days but didn’t get a call. I sent an e-mail, but just got an excuse. They told me that they wanted to hire me – that I got the job. And then they never called me again. At least I got some truffles. P.S. Thanks to Angelie from A Chef in Thyme for the Versatile Blogger Award! 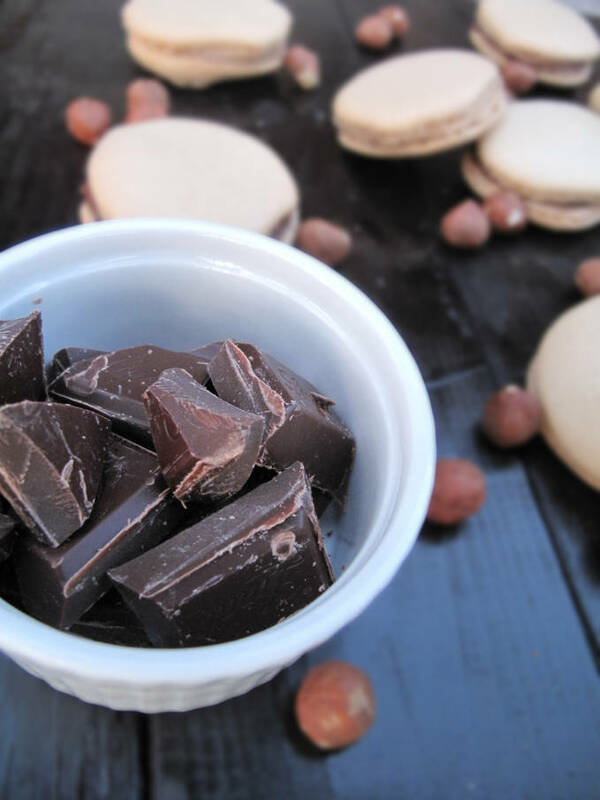 A recipe for delicious hazelnut French macarons with a dark chocolate ganache and a hazelnut buttercream. Preheat the oven to 300° and have ready a large (18”) pastry bag, fitted with a plain tip, along with two sheet pans lined with parchment paper. Bust out your food processor. Process the nuts and powdered sugar for about a minute. Take out the mixture and sift it, reserving whatever bits don’t pass through the sieve. Add these bits back to the food processor and run the machine for another minute. Sift again. You should have about 2 Tbsp of slightly chunkier almond bits - discard them. In the bowl of a stand mixer, combine the egg whites, sugar, vanilla bean (not the extract), and salt and turn the mixer to medium (4 on a Kitchen Aid). Whip for 3 minutes. They will not seem especially foamy at that point. Increase the speed to medium-high (7 on a Kitchen Aid) and whip another 3 minutes, then crank the speed to 8 for go another 3 minutes. At that point, turn the mixer off and add in any extracts/flavor/color and whip for a final minute on the highest speed, just to show it who’s boss (and to evenly distribute the color/flavor). At the end of this minute, you should have a very stiff, dry meringue. When you remove the whisk attachment, there will be a big clump of meringue in the center, just knock the whisk against the bowl to free it. If the meringue has not become stiff enough to clump inside the whisk, continue beating for another minute, or until it does so. Now dump in the dry ingredients all at once and fold them in with a rubber spatula. Use both a folding motion (to incorporate the dry ingredients) and a pressing motion, to deflate the meringue against the side of the bowl. Essentially, the macaron batter needs enough thickness that it will mound up on itself, but enough fluidity that after 20 seconds, it will melt back down. Transfer about half the batter to a piping bag. (When your bag is too full, the pressure causes the batter to rush out in a way that’s difficult to control, making for sloppy macarons.) After piping your macarons, take hold of the sheet pan and hit it with moderate strength against your counter. Rotate the pan ninety degrees and rap two more times. 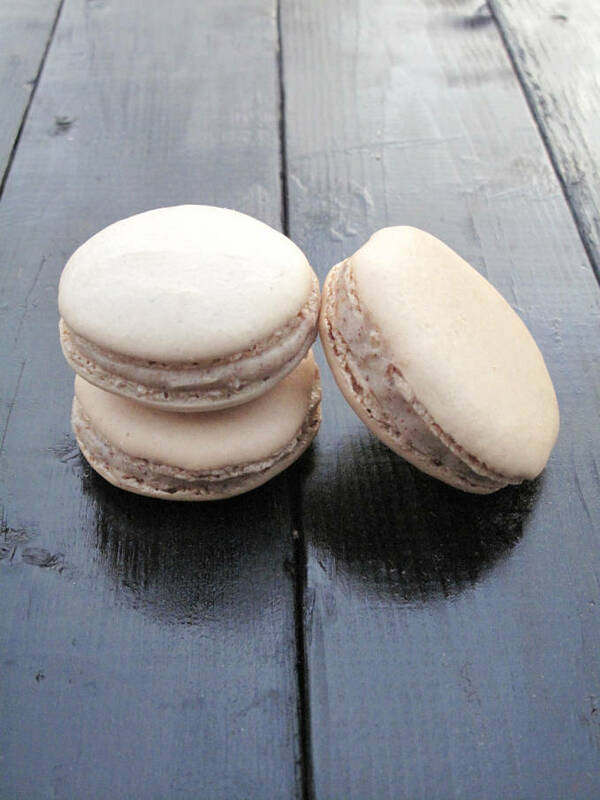 This will dislodge any large air bubbles that might cause your macarons to crack.Let the macarons sit uncovered at room temperature until you can touch the shell without any batter sticking to your finger (25-90 minutes). Bake for about 18 minutes, or until you can cleanly peel the parchment paper away from a macaron. If, when you try to pick up a macaron, the top comes off in your hand, it’s not done. Once the macarons have baked, cool thoroughly on the pans, before peeling the cooled macarons from the parchment. Use a metal spatula if necessary. Grind the hazelnuts until a paste forms, about five minutes. Whisk the egg whites and sugar in a bowl over a pot of simmering water until the sugar completely dissolves and the egg whites are warm. Transfer the egg whites to a new bowl and beat on medium speed until firm peaks form. Add the vanilla and continue beating. Add the butter one cube at a time until it is completley incorporated, and then add the next piece. Continue until all the butter is incorporated. Your buttercream might begin to look soupy. Continue beating at medium-low speed until it comes back together (about 10-15 minutes). Fold in the hazelnut butter. Melt the chocolate in a bowl over a pot of simmering water. Add the cream. Stir and let cool in the fridge . 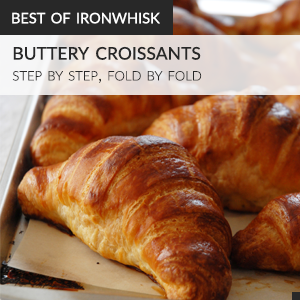 Fill a pastry bag fitted with the cream of your choice and pipe a quarter sized mound of it into half of the shells, then sandwich them with their naked halves. Let them sit overnight in the fridge before eating. Leave the French macarons out for about an hour at room temperature before eating. I had this same thing happen to me when I first began looking for a job. I staged (working for free) at an italian restaurant called Bricco Bracco. The chef said he was interested in hiring me and I kept calling for about a month. I finally just gave up, I have always wondered if he maybe was sexist though. All of his kitchen employees were guys, one of them was a culinary student from my class. But at least you found something now. But this recipe works out very well! What they did was very cruel and I am sure they will pay for it. The hazelnut buttercream idea seems awesome!! Your macarons also look amazing. Your macarons, however, look delicious. I don’t bake, but I do enjoy dessert! Do you peel the hazelnuts first? Yes. I toasted and peeled the hazelnuts first.